Profitability improved last quarter at the struggling retail icon -- but Sears Holdings still has no credible path to financial stability. Last Thursday, Sears Holdings (NASDAQOTH:SHLDQ) reported fourth-quarter results that were better than some analysts feared. The company was particularly proud of achieving positive adjusted earnings before interest, taxes, depreciation, and amortization (EBITDA) for the first time in three years. Still, it's one thing to earn a slight "profit" -- excluding major expenses like interest, pension costs, and capital investment costs -- in the seasonally strong holiday quarter. It's another thing entirely to be profitable year-round with no adjustments. There's no sign yet that Sears Holdings is approaching profitability in any meaningful sense. Furthermore, its balance sheet continues to erode rapidly. As a result, Sears remains on a path toward bankruptcy. Sears Holdings' fourth-quarter adjusted EBITDA of $2 million was roughly in line with the updated guidance that the company published in mid-February, and it was a $63 million year-over-year improvement. For fiscal 2017 as a whole, adjusted EBITDA improved by nearly $250 million but remained far from positive territory, at negative $562 million. While Sears Holdings' losses did recede modestly last year, the company's profit improvement was a fraction of the $1.25 billion in annualized cost savings that Sears supposedly captured over the course of fiscal 2017. That's hardly surprising, though, given that comparable-store sales plunged 13.5% for the full year -- including a 15.6% drop in the fourth quarter. This sales erosion offset the vast majority of the company's cost cuts. Sears Holdings reported massive sales declines throughout 2017. Image source: Sears Holdings. Sears CFO Rob Riecker noted that the recent rate of EBITDA improvement has continued in the first month-plus of fiscal 2018. However, that's not particularly impressive. First, Sears Holdings faces its easiest comparisons of the year this quarter, as Q1 was the only period in fiscal 2017 during which adjusted EBITDA deteriorated. Second, even if adjusted EBITDA were to improve by $63 million year over year in each quarter of fiscal 2018, full-year adjusted EBITDA would still be negative to the tune of $310 million. However, this may not be enough. 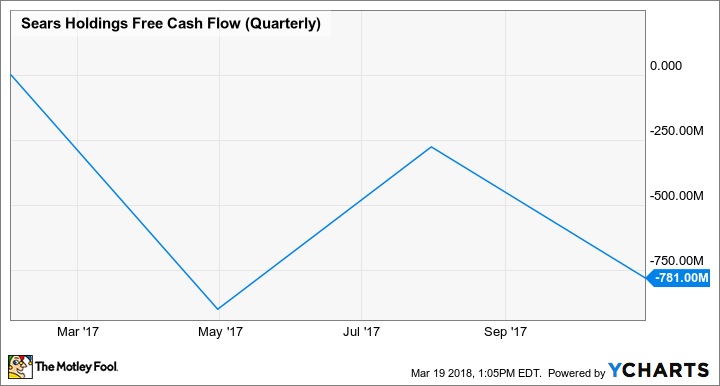 Sears Holdings' free cash flow tends to be deeply negative in the first three quarters of the year. For example, Sears burned nearly $2 billion in the first three quarters of fiscal 2017. Sears Holdings Free Cash Flow (Quarterly), data by YCharts. Sears Holdings has coped with its negative free cash flow by selling and spinning off a variety of assets. Over the past six years, it has reaped a windfall exceeding $8 billion thanks to these moves. However, its asset base is much smaller now -- and most of what remains is pledged as collateral for various debt and pension obligations. Sears did recently receive approval to sell properties appraised at $980 million that had been held as collateral to secure its pension obligations. However, after making $427 million of required pension contributions this year, the net proceeds from selling this real estate will be perhaps $500 million -- and possibly less, as store closures have reduced valuations for lower-tier retail properties. Management has implicitly acknowledged that it is running out of assets to sell by launching an aggressive effort to restructure Sears Holdings' debt. If third-party creditors don't agree to this restructuring, it will be extremely difficult for the company to meet its obligations by the fall. Sears Holdings may be able to survive 2018 through a combination of asset sales, debt restructuring, and perhaps a lifeline from CEO Eddie Lampert's hedge fund. However, aside from further store closures, management has only identified $200 million of additional cost-saving opportunities. As a result, barring a sudden improvement in sales and gross-margin trends, Sears Holdings will continue burning cash for the foreseeable future. Its financial position is much weaker today than it was a year ago, and its balance sheet is likely to deteriorate further during 2018. This could set Sears up for a final reckoning sometime in 2019.